These large, custom single family homes enjoy wonderful views of the The Lakes and The Dunes golf courses. 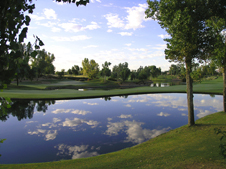 They are situated along the northern border of the Gainey Ranch development. Sizes range from 3000 to 7500 square feet. HOA fees run $487 per month. The Estates are one of four Gainey communities privileged to have “gate within a gate” security. Recent sales activity would indicate starting prices from the $1,800,000 area.